Incumbent Nicolas Sarkozy faces a challenge to hold onto the presidency with polls showing that Socialist Francois Hollande is on course to win the election. CANDIDATES IN THE French presidential election are making a final push for votes ahead of this Sunday’s election. Described as one of the most important French elections in decades, candidates have until midnight local time to deliver their message to voters before an election moratorium comes into effect until the weekend vote. 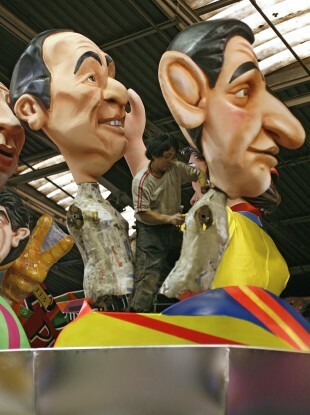 Incumbent Nicolas Sarkozy faces a stiff challenge from the Socialist Party candidate Francois Hollande. Polls indicate that the pair are neck-and-neck in this Sunday’s first round vote but Hollande leads the way in the run-off contest which will take place between the top two candidates on 6 May. Further down the polls, far-right candidate Marine Le Pen is third, with the radical leftist Jean-Luc Mélenchon in fourth followed by the centrist Francois Bayrou. A quarter of voters have yet to make up their minds leading to claims from Sarkozy supporters that a surprise could be on the cards. The rise of Mélenchon has been one of the stories of the election so far with the former Socialist tapping the mood of disenchantment with the political status quo. Today, he described international finance as “parasitic”. His rallies have attracted increasing numbers with his anti-capitalist rhetoric appealing to many. Although not expected to win, he is expected to poll well and where his votes will transfer in the run-off will be crucial. Polls indicate an overwhelming majority of Mélenchon voters will plump for Hollande in the second round. The economy is a key issue for voters with unemployment at almost 10 per cent and growth struggling despite Sarkozy’s claims that growth was good in 2011. Both leading candidates have promised to balance the budget, a situation that has not been achieved in France since the 70s. The EU Fiscal Compact, which Ireland will vote on in less than six weeks, has cropped up with Sarkozy unsurprisingly a key supporter of it while Hollande pledges renegotiation of the deal if it does not promote growth in the eurozone. Barring an unexpected turn of events, one of Sarkozy and Hollande will win the election and be France’s next president. While Sarkozy trumps his experience and criticises Hollande’s lack of – he has never held a senior government post – the Socialist candidate offers his fresh ideas and a pledge to revive economic growth. Other candidates in the race include the Green Eva Joly, Gaullist Nicolas Dupont-Aignan, Workers’ Struggle Nathalie Arthaud, anti-capitalist Philippe Poutou, and independent Jacques Cheminade. Email “French presidential candidates make final push for votes ”. Feedback on “French presidential candidates make final push for votes ”.